"We shouldn’t need most of the papers but you have taught me to be careful about these things. 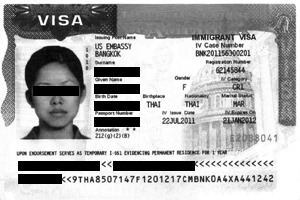 You can use this as a short reference to others seeking help with visas." Everything is going better than I expected. We came in through Newark, NJ as our entry point. The immigration officer was polite and explained a number of things to us and asked a few questions. He welcomed my wife and daughter to the US and we were off to Houston 30 minutes later. Bee and Aom are setting nicely. They were very nervous at first time in their new surroundings. My family has adopted them and they are becoming more acclimated to life in America each day. Bee met a girl from Thailand who lives close to us and they have become fast friends. Last weekend we went to local Thai Baptist Church and met a dozen more. Aom is in school and learning English quickly. I don’t think we would be in this position had we not received your help. We had no idea of the scope of the effort needed in the beginning. Their I-130′s have been approved and I am in the processing of filing for Change of Status. Soon They will have their immigration stamps and green cards. Thanks for all your help. We shouldn’t need most of the papers but you have taught me to be careful about these things. Thanks for everything you have done for us. You can use this as a short reference to others seeking help with visas. Good Luck to you. The entire staff make you feel completely at home. Anyone who is reading this letter please feel free to contact me. "I would have no hesitation in recommending your services to anyone else and feel free to pass along my contact information to anyone in my position who needs any information"
"I want to thank you for all your help in getting Dang her fiancee visa"
"I am very impressed with the information you have provided me and after careful consideration and speaking with other international lawyers"
"My fiancee obtained her visa after less than 5 minutes of interviewing, and I am sure it was because the officials had the proper paperwork. We were both relieved that it went so smoothly, thanks to U.S. Immigration Legal Advisors"